With the Sequence App you have the possibility to process a variety of growth processes or (transcendental) equations, such as x = cos x interactive. The consequences can be explicitly or recursively defined. 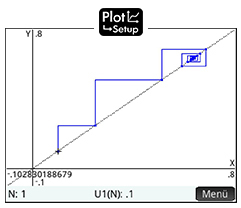 In the symbol -view the desired sequences are defined and activated by the tick box. In the above example, the logistic function with parameter 2.75 and the start value of 0.1 is used as an iterator. 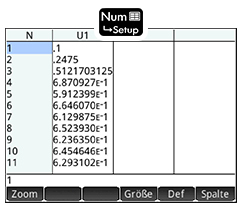 In the Num -view the results of each iteration are displayed. 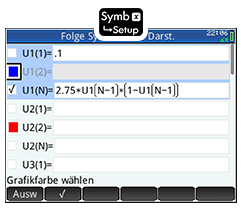 With a flick of the finger on the multi-touch display can be comfortably scroll through the table of values. Using the "Zoom" function, the value table are "refined" arbitrary.